DONGSHAN TOWNSHIP, Taiwan — One of Taiwan's fastest passenger trains derailed Sunday on a curve along a popular weekend route, killing at least 18 people and injuring more than 170 others, authorities said. There was no immediate word on the cause of the accident. 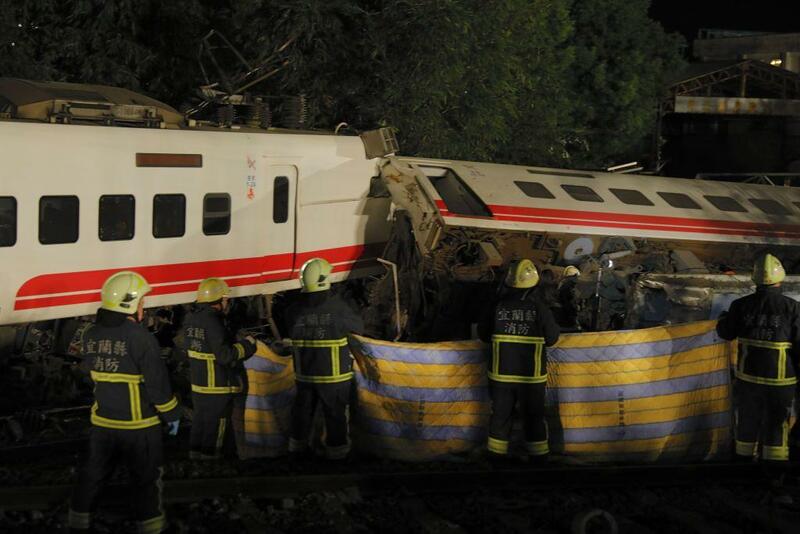 Most of the deaths were in the first car, and it was unclear whether other people were trapped in the train, according to a government spokesman, who spoke on the customary condition of anonymity. Some passengers were crushed to death, Ministry of National Defense spokesman Chen Chung-chi said. Earlier, the government put the death toll as high as 22, but the National Fire Agency, citing the Cabinet spokesman's office, later reduced that figure and blamed a miscalculation. Photos from the scene just south of the city of Luodong showed the train's cars in a zigzag formation near the tracks. Five cars were turned on their sides. Witnesses said they were forced to break windows to escape, and authorities said they have free everyone from the carriages, BBC News reports. Hours after the accident, one of the eight cars was seen tipped over at about a 75-degree angle, with the entire right side destroyed. Soldiers removed bodies to identify them, but nightfall complicated the rescue work. On a live feed provided by Taiwan's United Daily News, rescuers could be seen carrying what appeared to be a body wrapped in white plastic away from the site. Ensuring that rail traffic goes back to normal is also a priority, he said. Most people who were seriously hurt suffered head injuries and one was bleeding internally, said Lin Chih-min, deputy director of Luodong Boai Hospital, where four people were in intensive care. The hospital had treated 65 people total. The Puyuma was launched in 2013 to handle the rugged topography of Taiwan's east coast. It is distinct from the high-speed rail that runs on the west coast. The Puyuma trains travel up to 150 kilometers, or 93 miles, per hour, faster than any other in Taiwan except for the high-speed rail. A popular tourist train overturned in the southern mountains in April 2011 after a large tree fell into its path. Five Chinese visitors were killed. A train undertaking a test run ignored a stop sign and crashed into another train in northeastern Taiwan in June 2007. Five people were killed and 16 others hurt.